New techy endeavours and learning curves. Comment on blog entries via facebook! 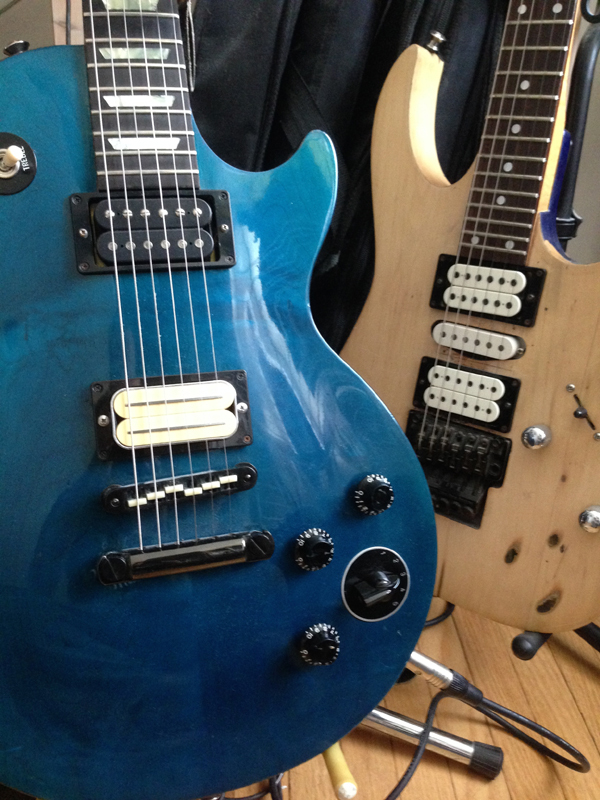 After seeing a friend of a friends post on facebook, a picture of two guitars- one a vintage/high-end looking BC Rich, the other one I did not recognize. The mutual friend showing me the post mentioned that this person probabaly wouldn't buy a garbage guitar. I've just finished updating the wiring job from the other week... Swapped out the Blusebucker for a vintage Lawrence L-500. As much as I like the Blusebucker, it is not versatile at all. It's also much easier to clean up a hot pickup. Les Paul wiring, 5way + 3way!!! A while back, I finally decided on the pickup set for my old fav `91 Ibanez RG570: Dimarzio PAF Pro in the neck and Evolution in the bridge, with a Wilde L-298sm in the middle (designed/built by Bill Lawrence). Similar to Steve Vai's setup, I thought it'd do this guitar justice. Way back in 2006, I "switched" to Linux from Windows Xp (even had a nifty tri-boot setup with WinXP, Ubuntu 7, and Marklar), but it was a half hearted switch: I was still using Windows apps (like Dreamweaver) within *nix. In late 2007, I switched to Mac. now visitors can comment on my blog entries with their Facebook credentials, no registration or user account required! Dusted off my twitter account, which I signed up for back in 2009 and did nothing with at the time... now to integrate it with this site! There's got to be a Drupal module for that... Added to the TODO list!